The closer you look at the Gozzard 36, the more well thought out features you will find on this classic Canadian cruiser. The Gozzard family has been building sailboats since 1970 when Ted and his brother opened up Bayfield Yachts in Ontario building a wide range of sailboats from 25 to 40-feet. In 1981 Ted split off and opened Gozzard Yachts which currently offers a wide range of power and sail yachts from 24 to 53 feet. 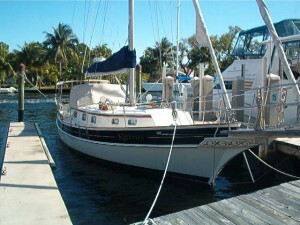 They built about 100 hulls of the subject of this review, the Gozzard 36, from 1984 until 1998. She features an unconventional layout, beautiful styling, and robust construction. The Gozzard 36’s lines and styling take inspiration from the classic long bowsprit, teak combed yachts of yesteryears. She is whole different animal than the fantastic plastic production sailboats that are most common along our shores. Although advertised as a 36-footer, she is 42-feet overall and, as I will describe later, a much roomier yacht than you would suppose. Gozzards and their Bayfield sisters feature a distinctively molded cove stripe with inset name. The 36 has a true cutter rig above, and 5′ draft full keel with prop aperture especially cutaway aft to limit wetted surface area. Gozzard is an old school builder with a rock solid reputation for quality construction whose 36-footer weighs in at a stout 18,000 pounds. She is balsa cored throughout the hull and deck except of course where thruhulls and hardware attach. The mast is deck stepped, the ballast external lead. Over the years the Gozzards have tinkered a bit with the design. One cool feature is a on post-1985 models the aft transom door became an option. This cut-out portion of the cockpit folds down to make a swim platform which is a must have feature for many cruisers these days. Another addition is the hard dodger you’ll see on most hulls as far back as 1985 as well. The deck has a large anchor locker forward that houses the propane tanks. The foredeck is wide open and so are the sidedecks as you walk aft. The cabin top features butterfly hatches which provide tremendous ventilation below. The cockpit is a marvel of yacht design, long with a beautiful teak table and sole. Here you start to note the little touches that the Gozzards have added. The table folds up from both sides and connects with an insert to create a large, rigid cockpit dining platform. The teak wheel aft is sweet and evokes that romance of being on the high seas that sailboat cruising is all about. Down below the solid mahogany wood is warm albeit a bit dark when all the hatches are battened down. 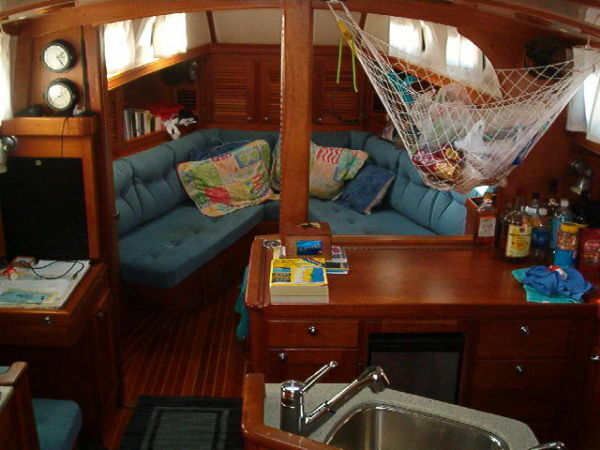 You are immediately struck by how open and large the accommodations are on this 36-footer. Gozzard has eliminated the forward V-berth or pullman arrangement typically seen on such yachts and instead created a remarkable saloon that converts into a private cabin with a double berth. Equally amazing to the openness are the well thought out features which allow you to convert in a few steps the yacht into one with two very private staterooms. In addition to the forward saloon conversion, the quarterberth aft with navigation station closes off for complete privacy. The true saloon is amidships while the galley is opposite and head aft to port. Engine access is from the companionway and through the starboardside quarterberth. Although the engine is well set below the cockpit, there is enough access. Fuel tankage of around 45 gallons is aluminium as well as 100 gallons for water and holding. I seatrialed a Gozzard 36 in March of 2012 in stiff breeze in the Cammachee River area. The Gozzard 36 will not win you any races, but her cutaway keel and 51′ stick’s large sail area with get you going especially in a blow. While everyone else stays in port, you will be safely underway or cosily asleep offshore. Her winch arrangement is unique with two centerline winches instead of combing mounted primaries like you see on most yachts. All lines almost invariable come to the cockpit as she is made for shorthanded sailing. The Gozzard 36 is a stylish, stout Canadian built classic meant for shorthanded sailing and serious offshore adventure. You will be amazed by her ample accommodations. Tradeoffs are performance and extra maintenance for the on deck brightwork. Comparables with similar styling include the Cabo Rico 38, Bayfield 36, and Shannon 38. You will find the Gozzard sell for a wide range from $100,000 to $200,000 and up depending on their vintage. Previous Previous post: Wind or Solar?